Have you ever tried finding safe things online for toddlers? Not toys, but educational games designed to keep children entertained and learn. Many of the apps out there are too difficult for small children or boring, leading to an unhappy toddler and even more unhappy parents. Having an educational background, I have had quite a few friends ask me to give recommendations of apps that are safe for their children. While there are a handful of good ones, most try to copy one another, leaving it difficult to find anything new and interesting for little kids. Recently, however, I found out about a new, interesting educational app for little children – HitStory Kids. The concept of this app is to teach toddlers about history through iconic characters and a fun, interactive game environment. Hearing the concept, I was very curious to review it! Looking for an educational kids app to keep children entertained on your iPhone or iPad? 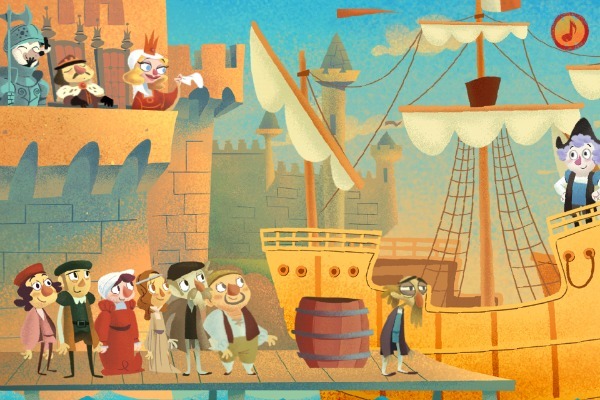 Introduce children to a magical new world based in US History with the HitStory Kids app. 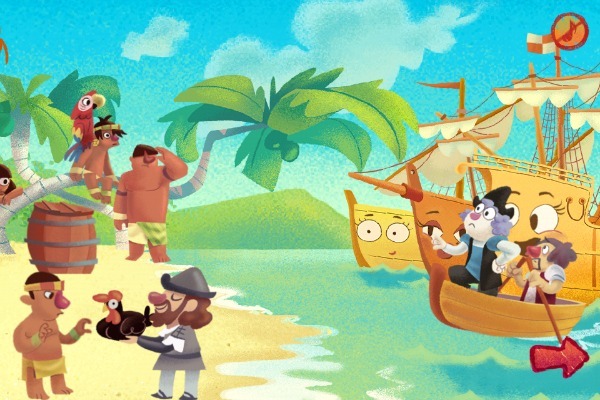 This app, designed especially for toddlers, places children in an iconic moment of US history, allowing them to learn basic historic facts as they interact with the environment and characters. Many of interactions are cute, funny, scary (not really), or just amusing for little kids. With the fun music and sounds, kids will look forward to learning with HitStory Kids! Okay, I won't lie, this whole entire children's app is a big giant cute attack. Everything in the HitStory Kids app is adorable and filled with lots of interactive activities for little kids. Kids can touch just about everything on the screen and get a response. For example, kids can interact with people, monkeys, crabs, barrels, and even save one of the ships from a mean octopus by touching it's legs. Even the ships themselves look like characters who wink or hide out of shyness. 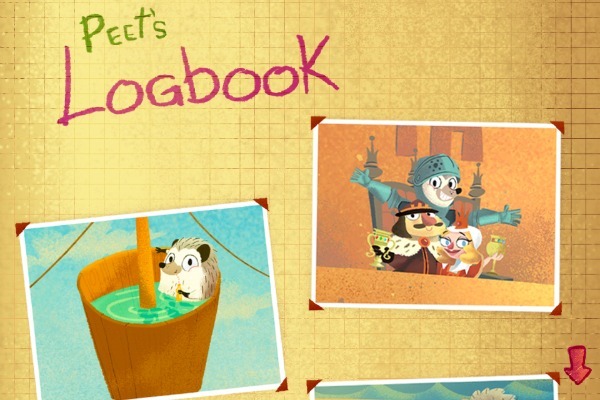 The real treat for kids, however, is their little friend on their adventure – Peekoboo Peet! Throughout eat of the scenes you can find this hedgehog hiding. When he is found, he does a cute little dance for little kids, helping them celebrate their find! With all the interaction and upbeat music, small children could easily get absorbed into this educational game. One of the cute things about the HitStory Kids app is how they take historical figures and bring them to life in a way that is interesting for kids. In the episode I tried – Columbus Sails – you are introduced to not only Christmas Columbus, but his crew on the Nina, Pinta, and Santa Maria. On the departure they met the King and Queen of Spain, the crew, and (at the end) even see the natives once they made their way to America. Kids are even able to see the dangers of the trip by one of the ships being attacked by a purple octopus, and a shark going around the other ships. While the historical aspect is very simple, it is a perfect introduction to US history for little ones and can lead to some fun discussion with adults. As someone who used to teach history, I have to say this is one of the most adorable apps I have seen in a very long time. It is extremely interactive, introduces kids to historical characters, and gives them a cute environment to explore. If you are looking for a fun app for your iPhone to keep kids busy at the grocery store or while you are making dinner, you will love HitStory Kids! 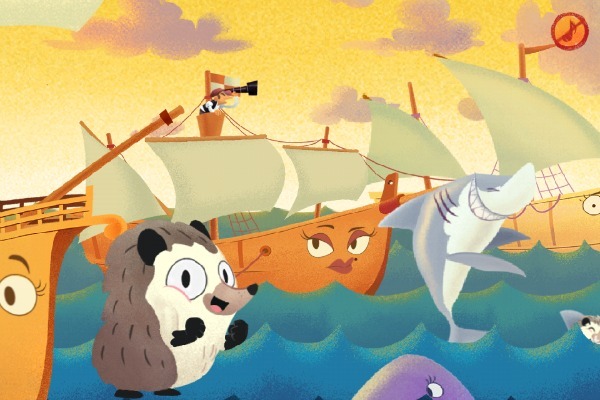 After trying out their Columbus Sails episodes, I am happy to give HitStory Kids an A rating. I would highly recommend this app for anyone who has small children! Want to download this adorable app? You can currently find it on the iTunes store for free! That's right, this adorable toddler app is perfect for playing on your iPhone, iPad, or iPod Touch. You just need to make sure you are on at least iOS 4.3. While the specs say it is optimized for the iPhone 5, you can play it older versions (I tested it on the iPhone 4S). To find out when other adorable games are coming out, also makes sure to follow them on Facebook, Youtube, Instagram, and even Twitter! Disclosure: Budget Earth did receive compensation for this review and downloaded the HitStory App for free for review purposes. All opinions on this product are my own, honest assessments, and may differ from our readers' opinions. I have been looking for more useful apps for my daughter, this will come in handy! Thank you! Thank you so much for sharing this information and had not seen this before but I will check it out. Happy Thanksgiving!! This is really great! Thanks for introducing it to us! This is perfect for entertaining my grandchildren when we are waiting for food in restaurants. This time of year there is more eatig out and slower service because of the holiday crowds. This is adorable and I love the educational aspect of it!